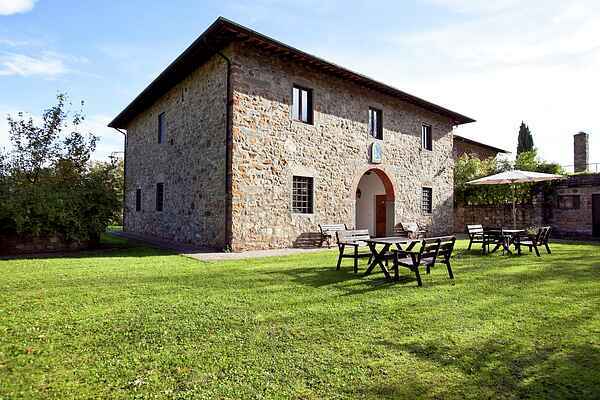 This large country estate has a 16th century castle and is in the Chianti area. The holiday home is in the central part of the estate and by the castle. There is a country house with a shared garden and swimming pool 700 metres away. You'll find plenty of opportunities to relax and enjoy yourself here. There are three more apartments at the castle. The estate produces and sells renowned wines. You can enjoy plenty of wine tastings. The castle's impressive wine cellars are well worth a visit. Enjoy a relaxing holiday in a unique location here in Tuscany. This house is located near the village of Dudda. In the center of the village which is only 1.5 km there is a small bar for breakfast and where you can buy some grocery necessities. The famous tourist attraction because of it's pretty main square and it's many lovely shops selling local specialties, Greve in Chianti is at only 7 km. It's a town of about 10,000 inhabitants, where you can find a supermarket, pharmacy, ice cream shop, newsagent, bar, drycleaner, shoe shops and clothing, rent a bike and scooters and all kinds of restaurants. Every Saturday morning in the main square takes place the country market, while every year in September we have the Chianti Classico Wine Festival. Another nearby old town is Figline Valdarno, 11 km away, where you will find the train station and the hospital. Near Querceto there are several restaurants with typical Tuscan cuisine where to eat the famous Florentine steak, ribollita and other dishes of the Florentine culinary tradition. For horseback riding the nearest stable is 5 km away, near the Ponte Stolli, while the golf course is at about 20 km, on the Chiantigiana in direction Florence. The closest airport is Amerigo Vespucci in Florence about 40 km away.